NEW! A Newsletter sign up form! Now you can subscribe to my newsletter to stay up to date on what's happening in our lodging and tourism industry. You can sign up on my website or on this blog in the right hand column at the top. And you are always welcome to shoot me an email just to ask questions about the industry. I do my share of educating curious and future buyers! Maine restaurants and hotels had a record-breaking year in 2016! 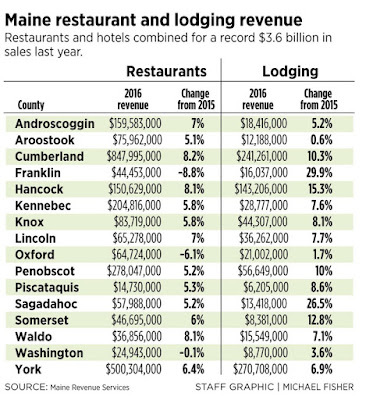 The Portland Press Herald reports "Maine restaurants and hotels had a record-breaking year in 2016, bringing in more than $3.6 billion in combined revenue, a 7 percent increase! The record sales were driven by an improving economy, warm and dry weather, and Maine’s reputation as a place for food, drink and travel." 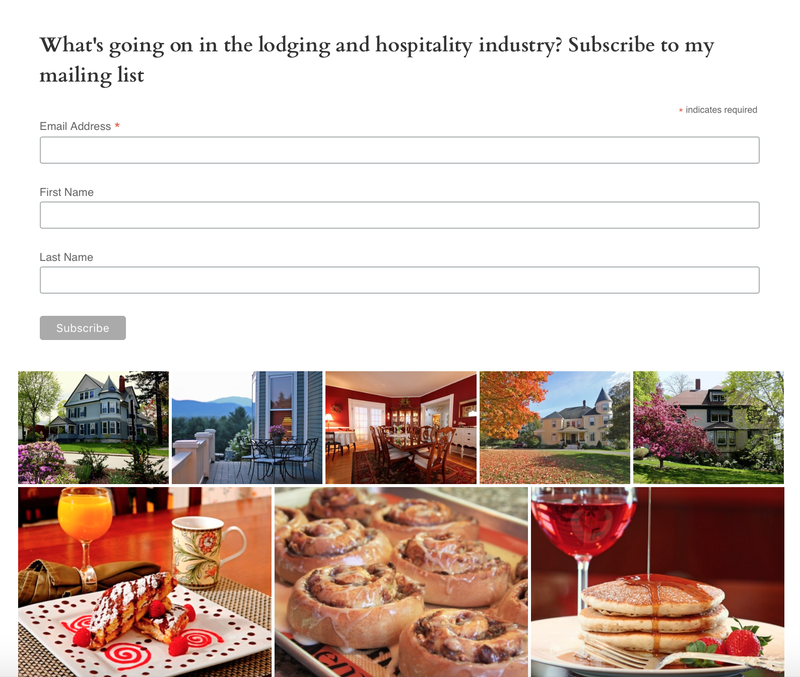 “My thinking on this is that there are more people who realize Maine can be a year-round destination,” said Steve Hewins, president and CEO of the Maine Innkeepers Association and the Maine Restaurant Association. Every county in the state had an increase in lodging revenue in 2016, according to data from Maine Revenue Services. Franklin County, which recorded more than $16 million in sales, saw the biggest percentage increase, jumping nearly 30 percent from the year before. Restaurant revenue rose everywhere except in Franklin, Oxford and Washington counties, the data show. Cumberland County led the way with almost $848 million, nearly a third of all restaurant revenue statewide. Portland, which has developed an international reputation for its food scene, accounted for $357.6 million of the total. “We jokingly called it a gastronomical high tide and we’re planning for an even greater 2017,” said Jim Britt, principal at gBritt, a South Portland public relations firm specializing in the hospitality industry. Britt also organizes the annual Maine restaurant week in early March. There seems “no end in sight to national and international media interest in Maine as a place to eat, drink and vacation,” he said. 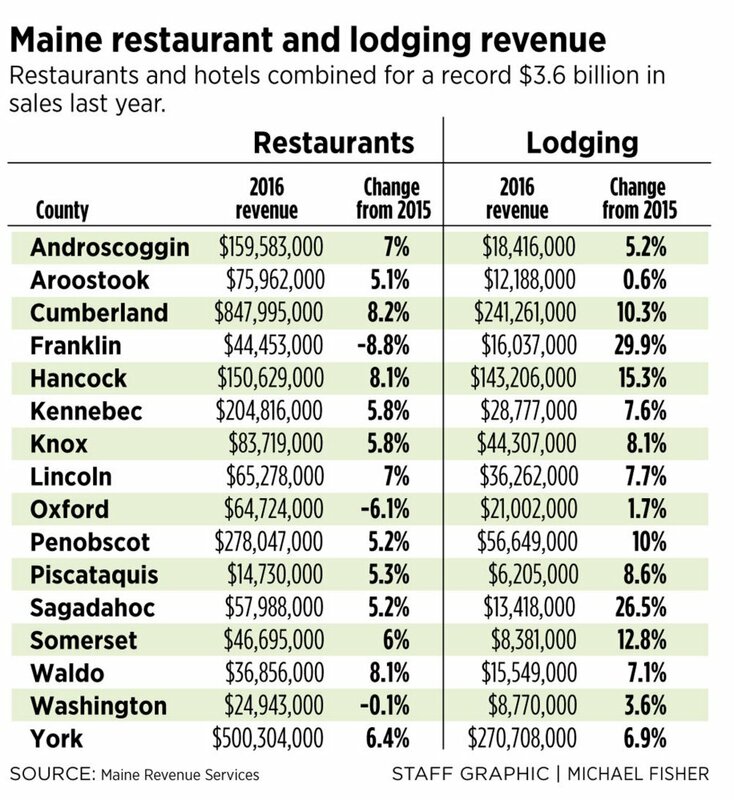 Restaurant revenue totaled $2.6 billion, an increase of 6 percent, and lodging revenue was $950 million, an increase of almost 10 percent, according to association estimates based on data from Maine Revenue Services. Taxes on restaurant and lodging sales brought in almost $300 million in revenue for the state last year, the associations said. Low gas prices, consumer confidence and a long, hot summer definitely played a role in boosting visitors and sales last year, as did the millions of visitors to Acadia National Park for its 100th anniversary, Hewins said. But he also thinks a five-year marketing campaign that the Maine Office of Tourism launched in 2015 is starting to pay off. 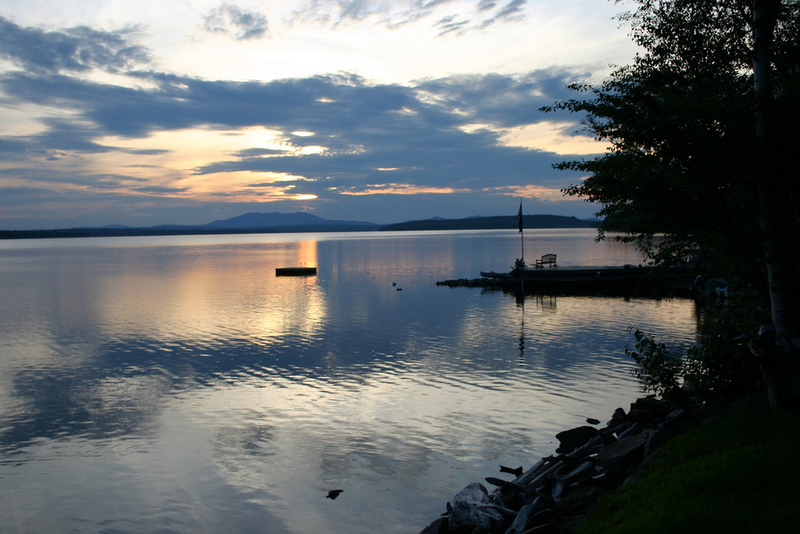 The marketing effort was aimed at getting first-time visitors to Maine and branding the state as a place to have authentic experiences. 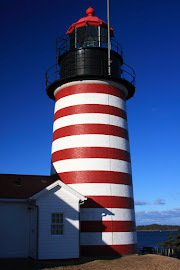 The number of visitors to Maine has grown for four straight years, with 35.8 million visitors arriving in 2016, according to the Office of Tourism’s annual report. Although tourists make up a big segment of lodging and restaurant sales, Mainers are contributing to the trend. About two-thirds of restaurant sales are from in-state residents, said Hewins, president of the restaurant and innkeeper associations. There is a wealth of dining options across the state and it is attracting locals just as much as tourists, he said. “We know the restaurant business is driven by in-state travel,” Hewin said. “It’s not just Portland, there are a lot of restaurants that are bringing people to small urban places. Maybe now is the time to get into a lodging property, while interest rates are still historically low and Maine's tourism industry continues to grow. 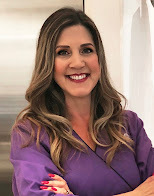 Check out my listings and contact me with any questions at all, I'm happy to help! 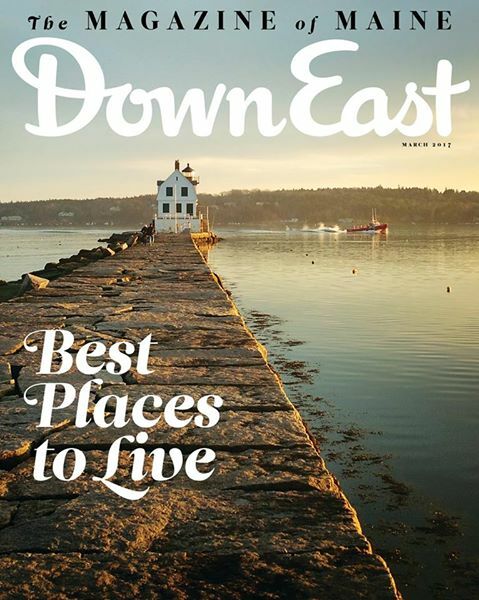 Down East Magazine held an online tournament for this year’s reader pick for the Best Place to Live in Maine...and the winner is? 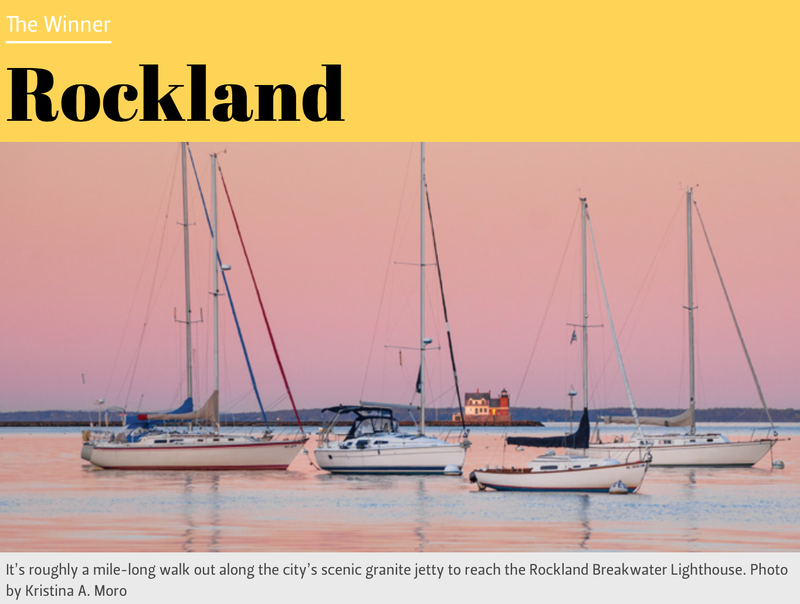 "YOU ONLY HAVE TO GO BACK A DECADE or so to reach a time when it may have seemed preposterous for Rockland to take top billing in a list like this. Long considered a saltier, grittier cousin to manicured Camden, Rockland slogged through a rocky transition from its economic reliance on fishing (and stinky fish processing) to a more diversified service and tourism economy. Of late, the city has hit its stride. True, the school system’s reputation is still middling, but Rockland has seen median income jump and percentage of families in poverty dwindle since the first decade of the 2000s. Moreover, downtown is hopping, thanks to what’s arguably the state’s most vibrant arts scene — there’s a pinch of wild, creative energy to Main Street’s gallery circuit, its foodie bustle, and the steady stream of new faces around town...." Click here to read the full article. Check out the Limerock Inn I have listed for sale. 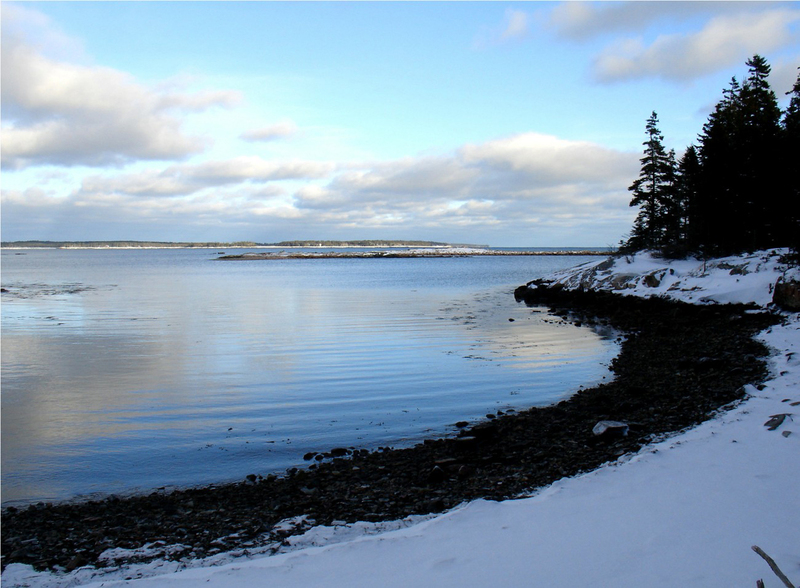 A wonderful opportunity to live, work and play, in a year round coastal Maine town! And situated midway between Portland and Bar Harbor, Rockland makes a great home base for residents and tourists alike. This wonderful historic inn designed by John Calvin Stevens just sold today. Congratulations to my sellers and to the new innkeepers. We wish them all the best!